Hisense has recently announced their status as an official partner for FIFA 2018. We spoke to Ryan Curling, Brand Manager at Hisense SA, about what this means for Hisense SA. PC (PriceCheck): What are the other exciting marketing initiatives you have planned (in South Africa) in the lead up to FIFA 2018? RC (Ryan Curling): Marketing activities leading up to the FIFA World Cup are still very much in the planning process at this stage. PC: How did the partnership materialise and, specifically, what does this mean for Hisense South Africa? RC: The World Cup brings together the highest level of competition and prestige in football worldwide, making it the perfect platform for Hisense Global and its local divisions to get involved in. Hisense and FIFA share a commonality in that both brands strive on competition, pushing boundaries, and innovating practice – it made sense for them to join in partnership. For Hisense SA, this sponsorship certainly serves as a massive marketing opportunity for the brand locally. PC: You’re already sponsoring the Lion’s, are you going to be sponsoring the South African soccer team, should they qualify? RC: Not at this stage. PC: Will you be using the Confederations Cup to help leverage your FIFA World Cup marketing campaign? RC: Yes, the Confederations Cup will be a good opportunity for Hisense to test-drive strategy and campaigns leading up to the main event. PC: Being the first Chinese consumer electronics brand to sponsor the tournament, do you feel this puts additional pressure in the manner in which you represent technology and China. RC: No, Chinese technology as a category has developed a strong and reputable name for itself in not only China, but around the world. Hisense, for example, has been number one in TV market share in China for the last thirteen consecutive years, and has held the number 1 position in TV unit share in the SA market for several consecutive months. Hisense as a top tier product manufacturer is therefore proud to be involved with an event of this magnitude. 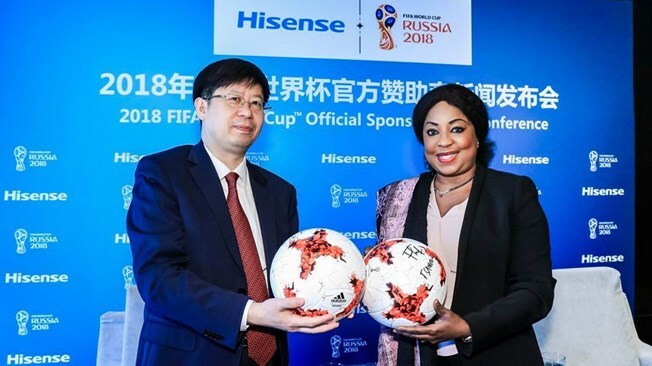 PC: With the FIFA World Cup being the most prestigious football tournament on the planet, how does Hisense plan to leverage this to further establish itself on the global stage? Will this see the development of more premium devices or will the focus continue to remain on value-for-money products? RC: Hisense will offer its technical expertise and products throughout the 2018 FIFA World Cup while also engaging in a joint R&amp;D initiative with FIFA to further push the boundaries of display technology. PC: Will ULED technology be used in the signage/display technology? RC: Although Hisense is the official TV Sponsor of the tournament, the exact execution of TV product display is still to be confirmed. PC: Will any of the R&D take place in South Africa? RC: This is still in the planning phase and will be confirmed at a later stage but we’re expecting this level of R&D to happen in China at the Hisense HQ. PC: Will this sponsorship see an increase in production and job creation at your factory in Atlantis? RC: Not immediately but plans are in place for the factory to expand as the brand grows locally and on the African continent.